I cannot think of anything more comforting than a bowl of hot steamy “Tarka Dhal”. 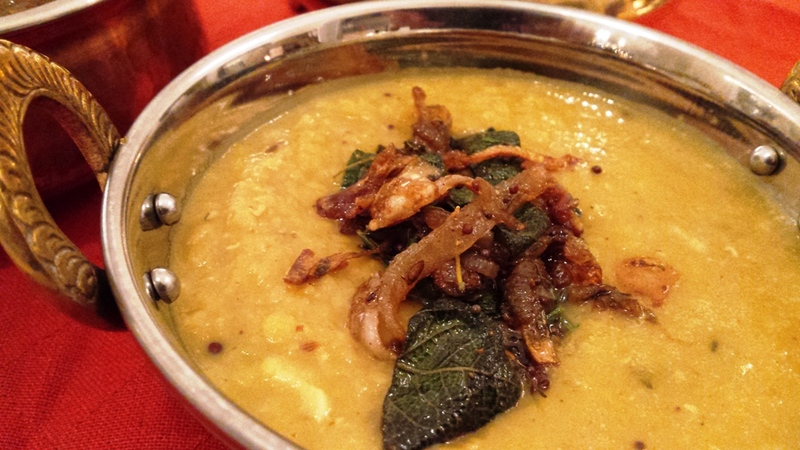 Dhal is a staple food, served in most Indian household – a true classic. Creamy, spicy, aromatic with a blend of golden roasted flavours of spices. Tarka dhal is very unique to each individual; this is my version, like most of my food I like them aromatic with subtle spices. Just by looking at a tarka dhal with all the ingredients in it may seems complicated but trust me this is a quick recipe. I use either red split lentil or Moong dhal for this dish as it does not take long to cook, turns very creamy and easy to digest. Enjoyed with Indian breads, rice, even with croutons or crusty bread. Here is one of my favorites, a very easy to cook meal that will be enjoyed by everyone. Chopped coriander leaves for serving – I like to add the coriander stalks in the dhal while it simmers. Wash the dhal in a deep saucepan, add enough water to cover and bring to the boil. As it starts to boil a white scum will start to form, using a ladle skim the white foam scum. Add salt, cinnamon stick, the bay leaves and leave to boil until soft. Cooking can take up to 20 minutes on a medium heat. While your dhal/lentils is cooking, prepare the tarka ingredients. Pour the taka over the lentils and stir it all in, leaving some of the tarka mixture for later. Leave the dhal/lentils to simmer for another few minutes or until all comes together. Taste for seasoning and texture as it should neither be too thick nor too watery. Just before serving warm the reserved tarka add a little drop of ghee, the dried chilli and pour over the dhal/lentils and enjoy the aromas as it sizzles.